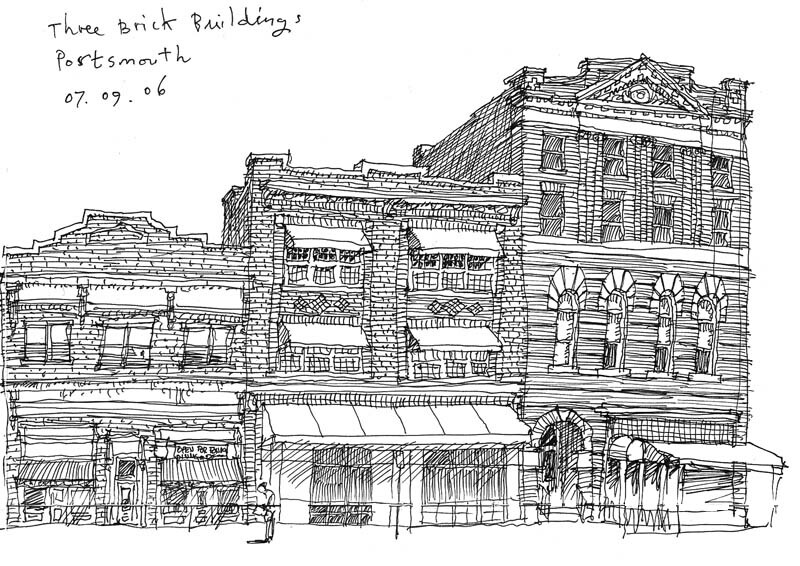 Over in the wilds of Portsmouth are many sketch ops such as this one. It's funny, Ye Olde Towne is so darn picturesque, so picture-perfect, that I didn't find anything I really wanted to draw. Same as if I went to Colonial Williamsburg. But on the edges it gets interesting, like here. What kind of metaphor to adopt is always top of mind when doing buildings like this. To capture the rich detail, or to suggest the general textures, or work in terms of light & shadow, involves moment-by-moment decisions, and usually, in my case, results in many inconsistencies. But there's inconsistency in the way we look at things, too. And a perfectly consistent drawing runs the risk of looking like a magazine illustration, like a "style". So I stay on the messy side of the line. July 9, 2006 by Walt Taylor.